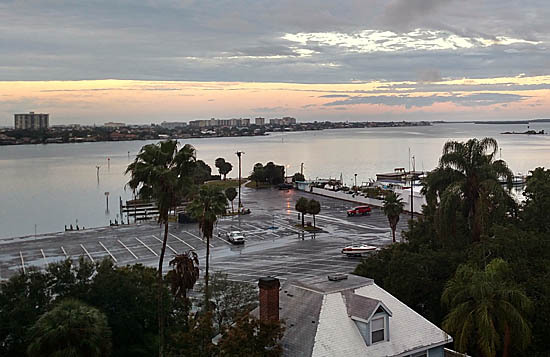 CLEARWATER, FL – I am thrilled to report I was able to start 2016 with a somewhat quick trip from Ohio down to Florida. 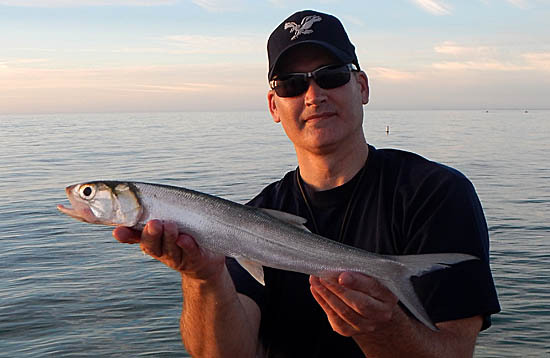 While I have fished saltwater a handful of times, it has always been off the coast of New Hampshire or Massachusetts, and a single trip out of Atlantic City, NJ. Needless to say, I was excited to make the trip as fishing saltwater is always a rare treat and this far south would be an altogether new experience. Even though the trip would be short (flying out of Akron on Thursday evening & returning Sunday afternoon), I would try to pack as much fishing into the time as I could. Each day of fishing will be posted on separately as “Part 1” and “Part 2”. The first evening would not provide any time for fishing, but I had a great time catching up with my friend Michael who moved to Clearwater around five years ago. Although he isn’t into fishing (crazy, right?! ), he was gracious to host me. I guess you could say my accommodations were the most upscale of fishing home bases a fisherman has ever experienced. After settling in, we hit the Palm Pavilion Beachside Grill & Bar for food and drinks. The next morning was day one of what I hoped would be two days of action packed fishing. The first day’s plan came together via a post I did on the RoughFish Forums. I had simply requested any information that anyone might be willing to share about the Clearwater, Florida, area. A person or two was kind enough to respond and one individual (Ryan), who was local, sent a private message offering to take me fishing around the area. It was a generous offer that I couldn’t refuse. It turned out that Ryan and I are ‘kindred spirits’ when it comes to fishing. We both are fishing bloggers (Ryan’s blog here) that enjoy multi species fishing and maintaining a life list of caught species. We also both appreciate the species that are often overlooked. Rather than wait for Ryan at the condo, I decided to walk over to the shoreline. As you can see from the above photo, it was a short walk. I did bring a 6’6″ travel rod and a very small assortment of lures and figured I might as well see if I could luck into a fish. On my very first cast, I hooked up with a small fish that came off within a few feet from being landed. I was disappointed but it would only get worse when my next hookup was stolen by a Pelican as I brought it in. Welcome to fishing in Florida, I would learn that birds of all types are quite troublesome to anglers. My disappointment was short lived as I became enthralled with what I was observing just below the water’s surface. I had no idea what they were, but there were literally hundreds of 18-24″ fish schooling right in front of me. I tried catching them with everything I had, without even the slightest nudge from a fish. I would later learn these fish were Mullet, who feed on plants, algae, and plankton. My next trip I will bring an assortment of flies to try, they would be fun to target. I’m curious if others are intrigued to do this too. After all of the mornings miscues- the multiple fish coming off, the bird thief, and targeting fish that don’t eat what I was throwing… I finally caught something. The timing couldn’t have been better that Ryan had just pulled in to pick me up when the fish hit. I not only was able to have him get a photo, he was able to tell me what it was, a Pinfish. 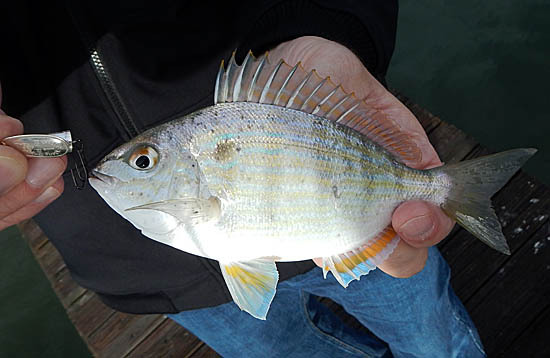 To people up north, let’s just consider this species the ‘Bluegill of saltwater’. Non noteworthy to locals, but a new species for me. After a quick stop at a bait shop, Ryan hustled me to our first destination in Dunedin. While Ryan contented himself in targeting larger more interesting fish, I was happy catching a host of hand sized fish to add to my life list. I encountered 9 new species to go with my Pinfish earlier, bringing the total to 10 new species caught in a half day of fishing. I doubt I will ever be able to duplicate that many new species over such a short amount of time again. 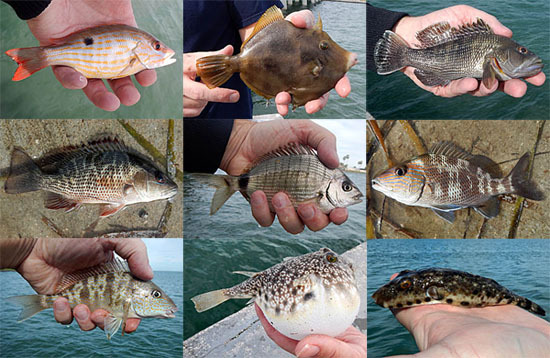 The species in the photo are; (L to R, top to bottom) Lane Snapper, Planehead Filefish, Black Seabass, Mangrove Snapper, Spottail Pinfish, White Grunt, Pigfish, Southern Puffer, and Bandtail Puffer. Ryan made the mid day decision to head to a new location, which was an excellent idea to get me to see some more fishing venues and an opportunity at more species. It was pretty safe to say I had successfully caught about anything hanging out on the shoreline at the first stop. The next fishing would take place in Pass-a-Grille after eating lunch at Sea Horse (no website). Both of us would catch more fish at the second stop, but nothing extraordinary. 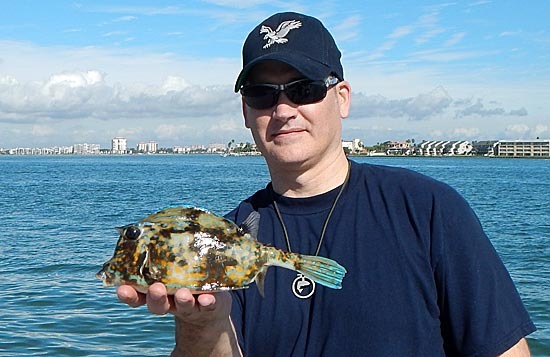 My highlight, was finding another new species under a dock, a Scrawled Cowfish. The new species total was now up to 11. Our third and final stop would be a short distance from where we had been fishing. Although only a short distance, fishing was significantly different with the species people were catching and the overall bite. It also was interesting in that as the afternoon went on the crowd of fisherman got smaller and the fishing continued to improve. Ryan and I watched a Blacktip Shark get caught, which was exceptionally entertaining for someone from Ohio. We also witnessed a big heavy hook up which turned out to be a large Atlantic Stingray. I was front and center for that as I got to net it, which was very fun. Seeing different things get caught motivated Ryan and I to get busy looking for action of our own, which we were able to do. Ryan caught a cool looking Lizardfish and followed up with two nice keeper Bluefish. 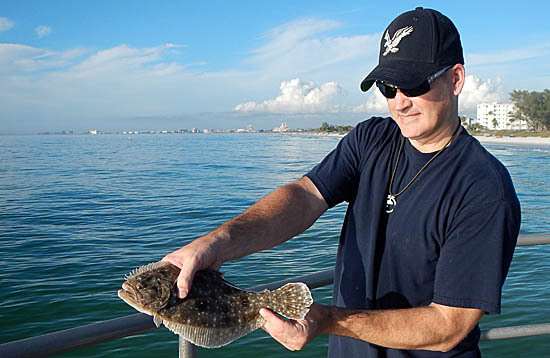 I landed two keeper Gulf Flounder, which was another species for my life list. As the afternoon turned to evening, it was closing in on time for the fishing to end. I was hoping to catch one last fish when I got an odd strike. Everything about this hit felt different and half the time I was fighting it I thought it was off. As I looked out at the beautiful Gulf sunset, my hooked fish was jumping and dancing all over the horizon. Whatever it was, I wanted to land it. The fish also would swim towards me giving my line slack and with all the jumps I was amazed it stayed on. Ryan expertly netted it, telling me it was a Ladyfish. The unique way it looked, the way it fought, the scenery, and even the size of it compared to what I had caught throughout the day – all contributed to making it my favorite fish of my personal catches. It was a great fish to end the day on, especially memorable on a day that was already perfect. I had hoped for a fun day of fishing and I owe a huge thank you to Ryan for delivering that big time! I certainly had no expectation that I would catch 13 new species or that it would be so much fun doing it. He is a great guy and I highly recommend you follow his blog (click here). Some might be wondering if I did anything for Ryan in return and you would be right for asking. I bought the day’s bait, lunch, contributed money towards gas, and gave him a small item of fish themed jewelry. As someone who promotes ‘trade a trip’ or similar types of experiences, I strongly urge people to be thoughtful when someone is generous to you! When I returned to the condo, Michael and I had a fantastic dinner at Kelly’s Chic a Boom Room – Blur. I loved the vibe of Dunedin, FL, and can’t wait to get back. To read “Florida fishing trip to start the year! (Part 2), click here.